Detroit Indianapolis is a surprising city. Not having been there for some years, the first surprise to me was the modern airport built over the last decade that first left me wondering what I might have been overlooking in the heartland. The second surprise was realizing how big the city had become, now over 850,000 by the last Census estimate, putting it even larger than the usual high fliers we see and hear more about in Austin and Charlotte for example. The third surprise was reading that over 70% of the city was white and only a bit more than 20% African-American with 9% Latino. Those figures seemed so not rust belt to me. The final surprise was finding for all of this growth and boosterism, when we hit the doors of over fifty homes in three days, that the Indianapolis neighborhoods were desperately hurting. 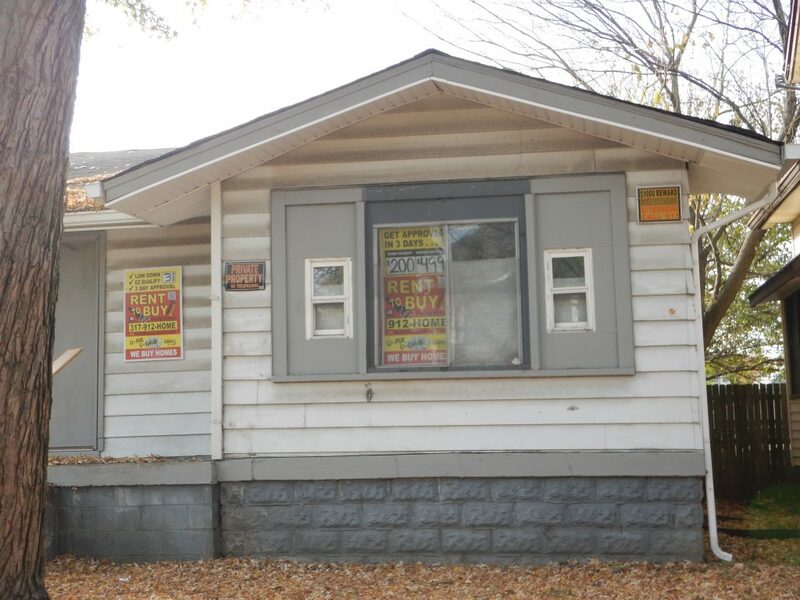 Indy seemed to almost be the rent-to-own capital of the United States, if anyone is keeping those statistics, but it would be no surprise to find out that no one is doing so. There wasn’t a section of city where ACORN’s Home Savers Campaign didn’t hit the doors. There were large lots, but small houses. I kept thinking of John Cougar Mellencamp’s song about “little pink houses.” Thousands of small, frame houses covered with siding, marked by black plastic, accordion extension tubes into the yard, and often gaps around the doors and roof edges to let in the cold. 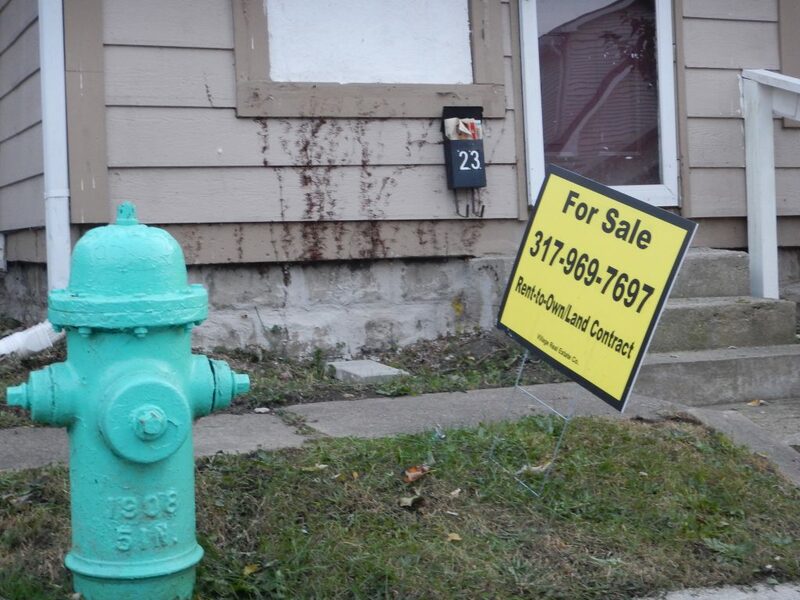 The level of abandonment wasn’t Detroit-scale, but every neighborhood was pocked with deserted properties, sometimes boarded up, but often vacant with the markings of the rent-to-own industry in the city. Rainbow Realty is without much doubt the largest. 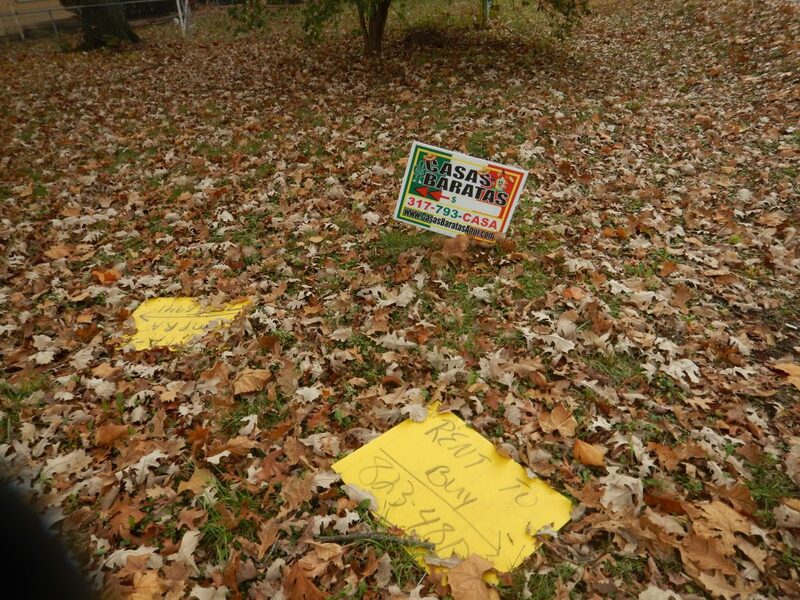 Their signs in a garish red and yellow with their rainbow trademark were easy to spot as we walked or drove by. Often when visiting a family in one of the homes, we could tell where we were by the fake security sign in the window with a picture of a police car and the false claim that there was 24-hour protection. The huge eye-bolts where a padlock had been affixed outside the door were always present as well. They weren’t alone. A sign saying Casa Barato, complete with pictures of sombreros in the colors of the Mexican flag, meaning Cheap House proclaiming Rent-to-Buy with a phone number were sure signs that someone thought there were Latinos moving into the area. Others were less florid, but still ubiquitous. We had been curious about Rainbow from stories in the Indianapolis Star about a fair housing suit filed against the company in June claiming discrimination and targeting African-Americans. The owner claimed innocence of course. He claimed he only asked for a couple of hundred down and allowed people to rent-to-own the houses for two years, and then it was theirs. On the doors, talking to recent occupants, we found more white families than blacks in the homes. We also found that most of the properties were contract-for-deed agreements with Rainbow for 30-years with interest near 11%. One contract for a $72,000 home had a minimal $700 down payment but a clear statement on the $163,000 in interest that the occupant would pay if they completed the agreement. Big “if” of course because missing payments means evictions and losing everything. Two other occupants, one white woman and one African-American woman told us how the company had changed terms in the first month in one case and allowed the wiring to be ripped off after she signed, but before she moved in in the other. It was unclear if Rainbow realized that with contract-for-deed agreements they are now under the jurisdiction of Dodd-Frank and the Consumer Financial Protection Bureau, but ACORN’s Home Savers Campaign will have to make sure they get the news on that ASAP. Indianapolis may be growing into a modern city, but there’s a dark, unregulated horror happening in the low-and-moderate income neighborhoods. There’s no pot of gold at the end of these rainbows.